In his book, An Astronaut's Guide to Life on Earth, Chris Hadfield takes readers deep into his years of training and space exploration to show how to make the impossible possible. Through eye-opening, entertaining stories filled with the adrenaline of launch, the mesmerizing wonder of spacewalks and the measured, calm responses mandated by crises, he explains how conventional wisdom can get in the way of achievement - and happiness. His own extraordinary education in space has taught him some counter-intuitive lessons: don't visualize success, do care what others think, and always sweat the small stuff. Chris Hadfield is one of the most seasoned and accomplished astronauts in the world. The top graduate of the U.S. Air Force test pilot school in 1988 and U.S. Navy test pilot of the year in 1991, Colonel Hadfield was selected to be an astronaut in 1992. He was CAPCOM for twenty-five shuttle launches and served as Director of NASA Operations in Star City, Russia from 2001-2003, Chief of Robotics at the Johnson Space Center in Houston from 2003-2006, and Chief of International Space Station Operations from 2006-2008. Hadfield served as Commander of the International Space Station where, while conducting a record-setting number of scientific experiments and overseeing an emergency spacewalk, he gained worldwide acclaim for his breathtaking photographs and educational videos about life in space. His music video, a zero gravity version of David Bowie's 'Space Oddity' received over 10 million views in its first three days online. 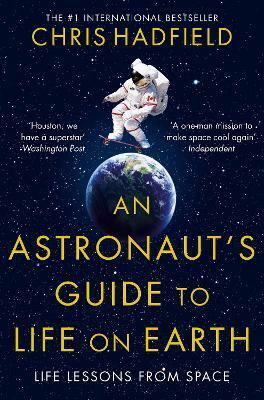 Chris Hadfield's book, An Astronaut's Guide to Life on Earth, sees his lessons learnt in space applied to life on Earth. He is also the author of You Are Here, a book of breathtaking photos taken from space. His TED talk has been viewed over four million times and he judged the BBC TV series Astronauts: Do You Have What It Takes?